In order to underscore my point, I would ask that you pause after you read my first question and before moving on to my answer: Who is Prospero Gallinari? Now, unless you are around fifty years old, or indeed older, and lived in Italy during the 1970s and 1980s, and/or unless you are an intimate student of contemporary Italian history, you probably have no idea who he is. Indeed, I would submit to you that the majority of Italians would not recognize the name at first blush. The question begged here, then, is, why did the New York Times have an obit on him in their obituary pages (p. 25) in the print edition of January 17, 2013, space they seem to reserve for people of a certain stature? 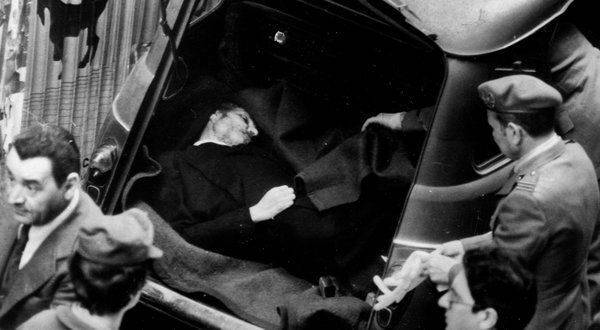 Furthermore, the article, now on line, is accompanied by a photo not only of Gallinari but also of the macabre scene of Aldo Moro’s murdered body, as you can see above. There is a second occurrence that raises questions. On page 19 of the same Friday edition, the New York Times published an article, a short piece indeed with large print of five lines and a large photo, on nicknames of Italian members of organized crime, beginning with that of someone who had been arrested the day before, and known as "Papa Smurf." Here, too, one wonders. Why would such a prestigious newspaper feel the need to publish such a piece, first of all? Then, why in Section A of the paper? Third, why stretch it all out, so that the piece with its large print and coincidental large photo occupy two thirds of the page, above the fold? Of course, the ultimate question is, why do it at all? I’ll stop here, as I suspect I may get the urge to return to this subject of what appears here at another time and in another venue.